Frank knows Jack. I'm talkin' Sinatra and Daniel's, baby! The legendary crooner, who passed away in 1998, returns in a push by Arnold Worldwide to pitch a high-end version of the whiskey rolling out nationwide in June. There's digital, print and a 30-second spot mixing archival photos with big-band music stylings and nightclub scenes. In one shot, Frank hangs out with comedian Jackie Gleason, who apparently introduced the singer to Jack Daniel's in the late 1940s. When it comes to resurrecting dead celebs as endorsers, I prefer this relatively simple approach to some efforts by other brands. It seems less forced than, say, using high-tech hijinks to make dear, departed Audrey Hepburn hawk candy bars. Plus, Frankie was a true fan, calling the drink "the nectar of the gods" and toasting crowds at his concerts with Jack. So his presence feels genuine. It's also an interesting contrast to the week's other big spirits endorsement deal. 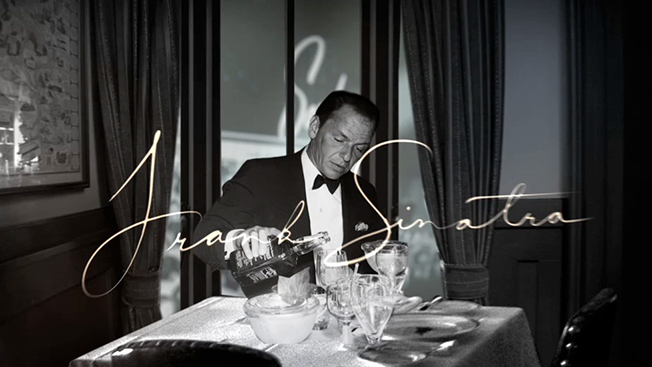 It's hard to picture Mila Kunis pounding back Jim Beam, but imagining Sinatra goofy on Jack, slurring the words to "My Way" and cursing Ava Gardner as he stumbles into a limo? Ring a ding ding! TV Spot: "Frank The Man"